Concussion is the most common head injury in sport and is caused by a temporary disturbance in brain function due to trauma. It can occur following sudden violent movement of the head, usually in a tackle or collision. Most damage is caused by rotation and acceleration (e.g.spinning of the head caused by a blow to the side of the head). Concussion may occur with or without loss of consciousness. A free resource - ‘Sideline Concussion Check’ - contains information about managing a suspected concussion. Does the player show any of these signs? 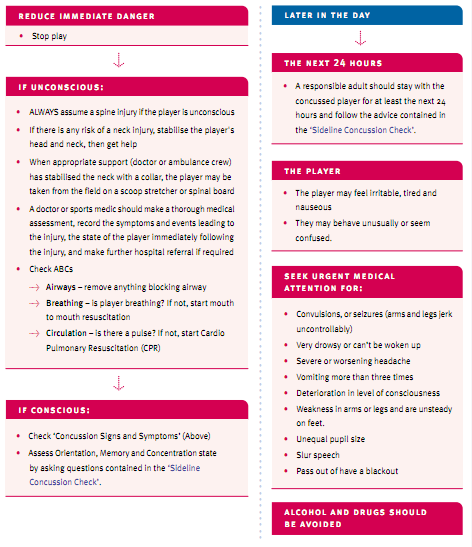 If a player shows any of these signs, ask the player the questions contained in the ‘Sideline Concussion Check’ card. What should you do if concussion occurs? What rehabilitation should follow a concussion? It may take days or weeks to fully recover from concussion. There is no pre-determined way of knowing how long recovery will take. No concussed player should return to training or play for a period of three weeks after they were concussed. After this period the player may only resume participation when they are symptom free and have received a medical clearance. Coaches should sight the medical clearance before permitting the player to take part in training or play. Many symptoms are made worse by exercise so rest is the most advisable. Once acute symptoms pass, a gradual return to low level aerobic training followed by non-contact drills and finally contact play is recommended. This should only occur after receiving a medical clearance. If symptoms persist for a few weeks to six months or more this is called 'post-concussion syndrome'. This may be associated with headaches, a reduced concentration span, slow decision-making, dizziness, fatigue, irritability, impaired memory and personality changes. What are the effects of repeated concussion? There is no definitive number of times a person can be concussed before retiring from play. Thus it will be dependent on the player involved, the medical treatment and advice they receive. Definitive arguments around this issue are difficult to make given the equivocal nature of the literature and insufficient research having been conducted in relation to this issue in sport. Some research would argue that the likelihood of serious sequelae increases when a mild traumatic brain injury is repeated, with longer term effects more evident with repeat concussions. Cumulative effects of repeated brain trauma is also believed to play a significant role in the development and persistence of post-concussion syndrome. In athletes with symptoms from a previous concussion, a second blow to the head may cause brain swelling, coma or even death. When can the player return to sport? were concussed. After this period the player may only resume participation when they are symptom free and have received a medical clearance. Coaches should sight the medical clearance before permitting the player to take part in training or play. The only exception to the three-week stand down is some senior player in international competition. These players can return to competition before three-weeks have elapsed if they are symptom-free and received a clearance from a recognised neurological specialist. What is computer based testing for concussion and how is it used? Neurologists and other brain injury specialists have developed a number of standardised tests that assist in examining the impact concussion has on brain functions. Computer software containing versions of these tests have recently become available. For more information visit www.impact.com or www.cogsport.com. Players must be tested prior to the season to establish a baseline and are tested again if they receive any head injury. Players are not permitted to resume play until their score on the tests returns to their baseline levels. programme specific to you and your injury. How can you reduce the risk of another concussion? Rugby head gear is NOT designed to reduce concussion.